This week, Musty and I are celebrating our 7-year anniversary. The actual anniversary is next Monday, but since it's our 7 th year together, we are celebrating with 7 days of fun dates! Tuesday we did Something New and walked our dogs on a trail in a park where we had never been before. Yesterday we did an Old Favorite, and had a lunch date in downtown Santa Cruz together. 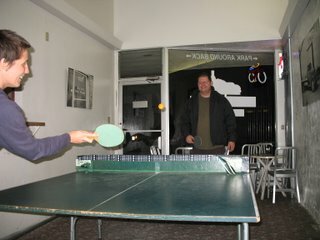 Tonight we did Something Playful and went out to our favorite pizza place and played ping pong on their ping pong table!! 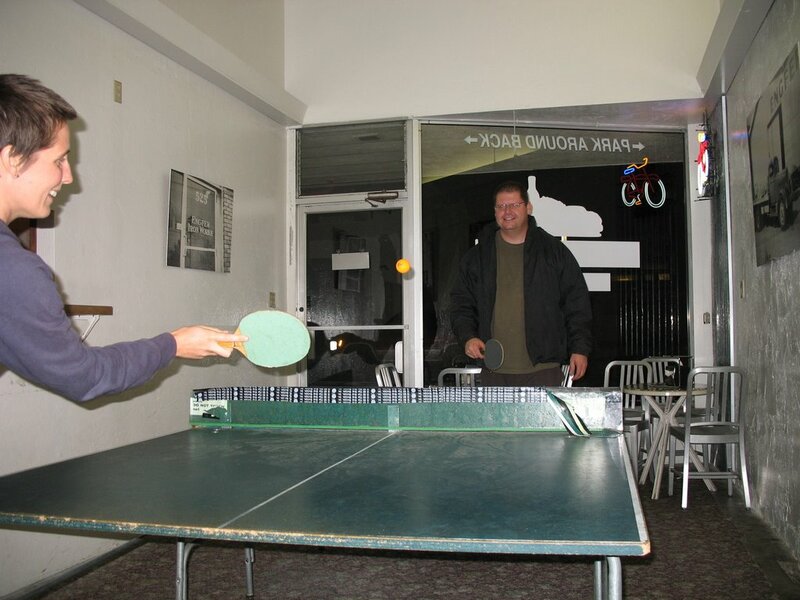 Here we are playing ping pong together. I loved the florescent orange ball, and the wonderful "pop pop" sound of the little ball bouncing. It was super fun. This pizza place "Engfers" is really so wonderful! 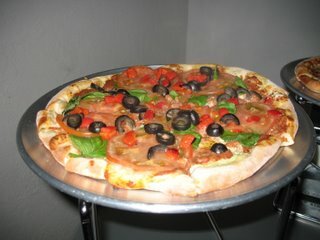 All their pizzas are baked in a wood-fired oven, and - best of all - they have an AMAZING vegan pizza topping! It's a spicy tofu-tomato mixture, and then you can pick any veggies to put on top. I got fresh spinach (a double dose! ), fresh tomatoes, olives, & roasted red bell peppers. It was SO good!! Also, they have a huge selection of fun drinks and even have tofutti cuties in their ice cream freezer. And everyone who works there is really, really nice. We had a great date! Also, Kaji's Mom's blog reminded me to write about Thanksgiving plans. I am very lucky to have a big family, all of whom I love very very much. My aunt L is a vegan and my aunt S is a vegetarian... and everyone else is very friendly toward the whole concept. Unfortunately, there is always a turkey - it would be really nice to celebrate such a lovely holiday without the turkey - but at least my mom always orders a free-range, no-hormones turkey from the health food store. Also, everything else on the table is vegan. So the mashed potatoes and veggies and dessert and so on is all vegan. My mom even makes us some vegan stuffing! I am always in charge of the desserts, and I think this year I will make the pear cranberry tart from VwaV - I just made it recently and it was SO good. For dinner we are going to make the "Stuffed Collard Greens with Zesty Tomato Sauce" from the "Modern Vegetarian Kitchen". We always make a really good vegan entree, and make enough to share with everyone. Spreading goodwill for veganism through happy tastebuds! Our veggies & sides will include roasted butternut squash, salad, roasted garlicy brussel sprouts, and mashed potatoes. Yum yum! Can't wait to hear what the rest of you have planned. Congratulations on your anniversary! I have read about Engfers pizzas. I can see why that's a favorite date place for you. You're lucky to have other veg'ns in the family. Your menu sounds perfect. I'll be going out to eat for Thanksgiving, hoping they have a huge salad, a vinaigrette dressing, and veggies not drenched in butter. Awww, happy anniversary! Look at you cute kids, playing ping pong. I'm glad you guys are doing a 7-day celebration- how fun. And that pizza looks gorgeous! We are going to have two thanksgivings here- one with Daiku's students this weekend, and one with just the two of us on the actual day. I can't wait to get cooking. Happy anniversary. Mamma mia--that pie looks good. I love that you're doing 7 fun things for your 7 year anniversary! The more years you have together, the more fun it will get! Great to hear you family is so supportive. Mine's great...but I can't say that everything but the turkey would be vegan...that's cool! Thanks for the nice anniversary wishes! AtxVegan- I hope you have a great thanksgiving salad! :) That's a nice idea. Bazu- yeah, that pizza is so tasty! How fun to have two Thanksgivings, especially to have the group experience and the intimate experience. sounds really nice. UV- thanks! That pie IS really good... I recommend it! It's really rich... so you've gotta have some veggies and such with it. Megan T.V. - Yeah, you're right! Maybe next year we'll have to think of eight different things to do! :) Some people have such trouble being vegan and being with their families, so we are lucky, aren't we?